The collected works of Carlos Garcia Tolsa (1858-1905) consist almost entirely of characteristic dances including waltzes, polkas, habaneras, mazurkas, and a gavotte- the two exceptions being the sonata "Al fin solos" and a nocturne called "Meditacion". 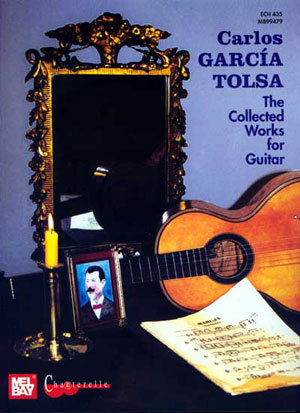 Known as a fluent improviser, the sixteen works included in this volume are apparently all that Garcia Tolsa actually set to paper, and therefore the only extant summary of a lifetime of artistic pursuit with the guitar. Salon music of this nature was very popular worldwide in the late nineteenth and early twentieth centuries and is familiar to most guitarists through the works of Tarrega and Barrios, both of whom were influenced by Garcia Tolsa. Consequently, while Garcia Tolsa’s music is easy to listen to and offers few surprises, its delight lies in the skill with which these pieces were written. In a very natural and controlled way, the music modulates from one key to another, and beautiful bass lines created by the generous use of chord inversions give it an elegant and sophisticated character. The music itself is presented in clear facsimile reproductions of the original editions (standard notation only) interspersed with period folio cover images. A transcription for 10-string guitar of Beethoven’s Piano Sonata No. 14, op. 27, No. 2, in Garcia Tolsa’s own hand, is also included. In addition to the music, this volume contains detailed historical and performance notes plus Spanish language entries on Garcia Tolsa by guitar historians, Domingo Prat and Ricardo Munoz.